The main objective of this course to teach R statistical environment to be applied to high-throughput biological data. After this course, you will be able to use R for analyzing diverse data types from high-throughput biological experiments with a strong focus on different transcriptomics methods. 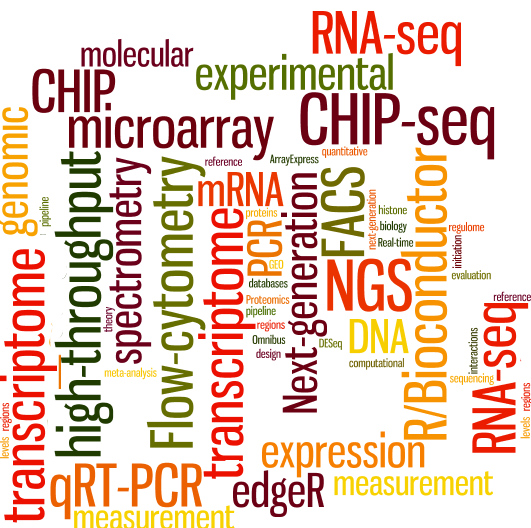 Half of the course is dedicated to the analysis of data from next-generation sequencing experiments. All the topics will introduce the theoretical aspects of the introduced methodologies, and after that, assignments and activities will provide opportunities to explore the practical ways of performing the analyses. You will learn how to use R and different Bioconductor packages to analyse data from microarrays, NGS, and flow cytometry experiments. Research topics ranging from differential gene expression via transcription factor binding to cellular markers are explored and used to demonstrate how data analysis works in different situations. Special requirements: You will have to use the R software for the practical parts of this course. R is a free software programming language and a software environment for statistical computing and graphics. You have to be able to install this free software on your computer. To have a working knowledge of using R and Bioconductor packages, it is strongly recommended to study our Biological data analysis with R course or some equivalent material. 6 course weeks supported by a practiced bioinformatics lecturer. In addition to the material you will get active assistance to get the most benefit from this course. After starting this course, you will be able to access all the course material for 4 months. Select the box next to the course, and pay for the access using PayPal or your credit card.